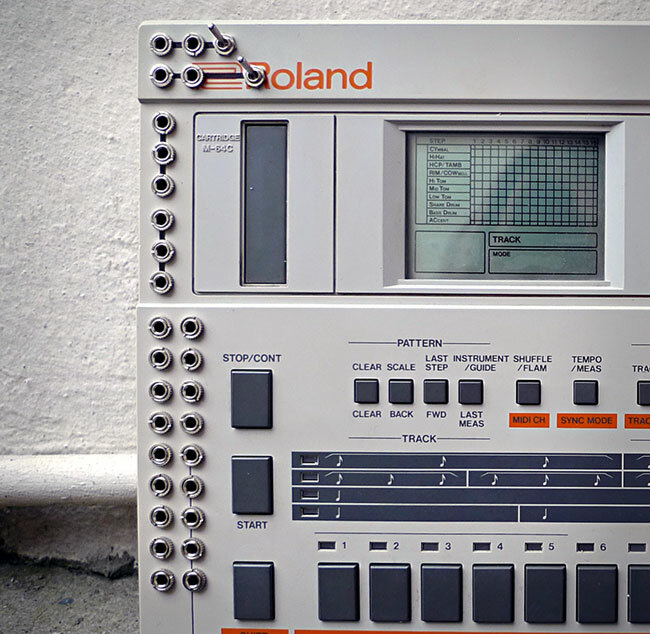 The Roland TR-707 and TR-727 are another pair of classic drum machines that are, in our opinion somewhat overrated but the fairly average original sounds are more than made up for by the classic Roland user interface. As with the TR-505 and TR-626 mods, the TR-707 Drum Destruction mods add some serious modular patching action to turn it into something that wouldn't sound out of place on the shop floor of a steelworks. 18 way main patchbay: More information and details of our patchbay mods can be found HERE. 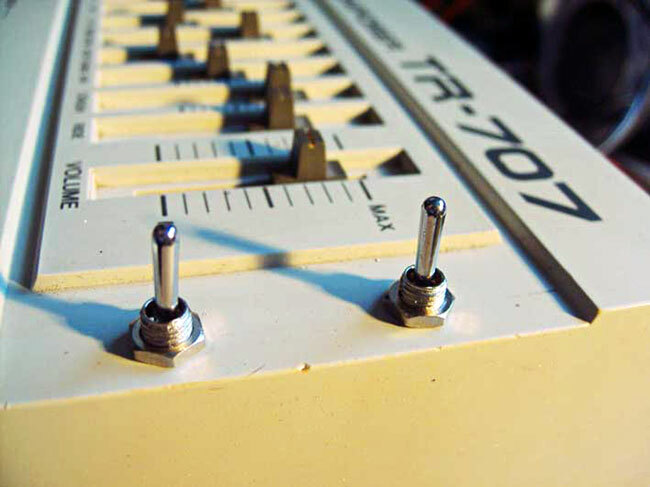 The TR707 patchbay excels in compressed punchy percussion effects ideally suited to chunky techno groove percussion, hard mid-range heavy breakbeats or fast rolling Drum & Bass breaks. 2x 3 way DAC distortion switches. These switches offer four types of distortion from all out electro grinding and crushing noise, to a mild overdriven crunch. Each switch also has an effect off setting. This mod adds two knobs to control the decay of the open and closed Hi-Hat sounds along with an external audio input socket. 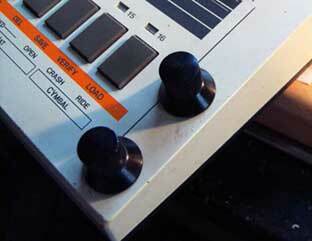 On the TR-707 the open and closed hats sounds use the same sample with different envelopes. This mods adds individual knobs to control the decay of each sound but in order to do this the open hat decay knob has to act as a kind of overall 'master' decay for both sounds and the closed hat decay knob sets the decay of the closed hat within the maximum setting of the open hat knob. Essentially this means that when the open hat decay is set to full, then the closed hat can be set anywhere from a tiny click to the full open hat sound, but when the open hat is set only half open then the closed hat can only sweep from the tiny click sound at minimum to roughly the normal closed hat and full. This is virtually impossible to explain so we hope you get the idea. Audio input: This is a jack socket placed on the right end on the machine that allows you to run an external signal through the Hi-Hats bus. Plugging a jack into this socket removes the Hi-Hats from the mix and replaces them with any external signal. The external signal is chopped and gated according to the Hi-Hat envelopes and programmed Hi-Hat pattern. 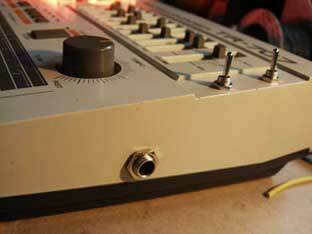 The level of the external signal is controlled with the normal Hi-Hats mixer slider. 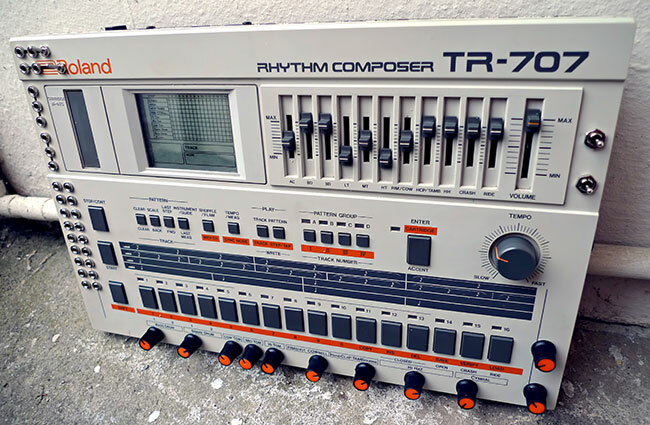 These mods can also be applied to the TR-727 but on the 727 the knobs control to the short and long whistle rather than Hi-Hats. Its therefore not stunningly useful but the external audio input still works just as well as on the 707. This mod gives you 9 individual pitch controls. Theres one for each sound group i.e. the two snares share the same pitch control, as do the Rimshot / Cowbell etc. The only exception to this are the Crash / Ride cymbals which share a pitch control despite having separate volume faders. The pitch controls are very wide ranging and can take the pitch of the sounds from short blips at the top end, to a crunchy mess of sample aliasing noise at the bottom. Take a look at the YouTube video below to hear the kind of sounds you can expect from this mod. 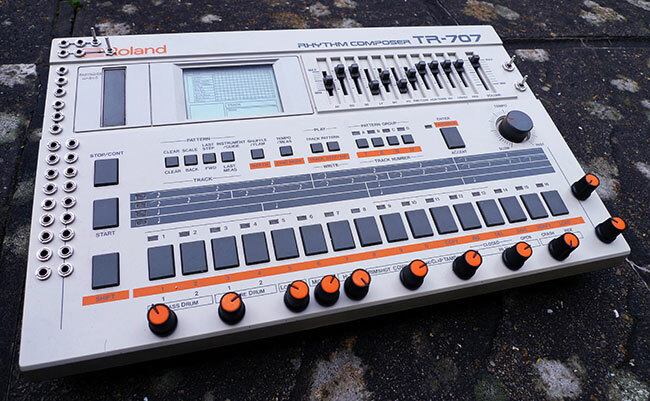 if you want your TR707 modded get in touch using the CONTACT form.